Head of the Al-Hikma National Movement, Sayyid Ammar al-Hakim, in a speech on social networking sites Wednesday, 5/9/2018 expressed his deep concern about the unfortunate events in the city of Basra, and called to urgently contain the situation, warned of the event expansion in which will jeopardize the security and stability of the city of grace. His eminence condemned the use of weapons against demonstrators, stressed on distinguishing between peaceful protestor and infiltrators in order to avoid running risks, called to start urgent investigation of the perpetrators of recent events that resulted in casualties in demonstrators and security forces. His eminence urged religious, official, cultural, academic and media actors to work to heal the rift and preserve the national unity and work to prevent deteriorated sequence of events in the province. 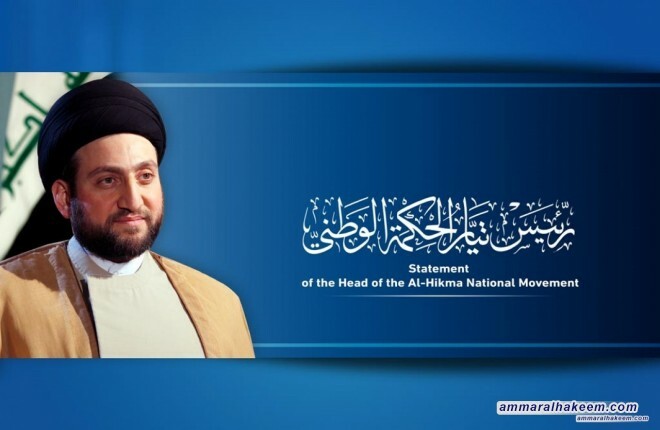 His eminence called on all departments of the federal government to deliver urgent relief assistance to sons of Basra through the available means, reiterated the right to demonstrate to claim legitimate rights and services without damaging public and private money, and demanded the security forces to keep the lives of peaceful demonstrators.